Any idea how much time you spend on email per day? Per week? In a lifetime? The Washington Post has a fun, or perhaps dispiriting, calculator to help you determine those numbers. According to the article, the average office worker spends just over 4 hours checking work email each day. Do the math, and you’ll see that’s 20.5 hours each week, and more than 47,000 hours over a career. And that’s just work email. While that might be a little alarming for some of us, those figures scream opportunity to marketers. We covered how to create Gmail Ads in AdWords when it was first made available to all advertisers, but as more marketers catch on, the need to stand out from the competition becomes even more crucial. 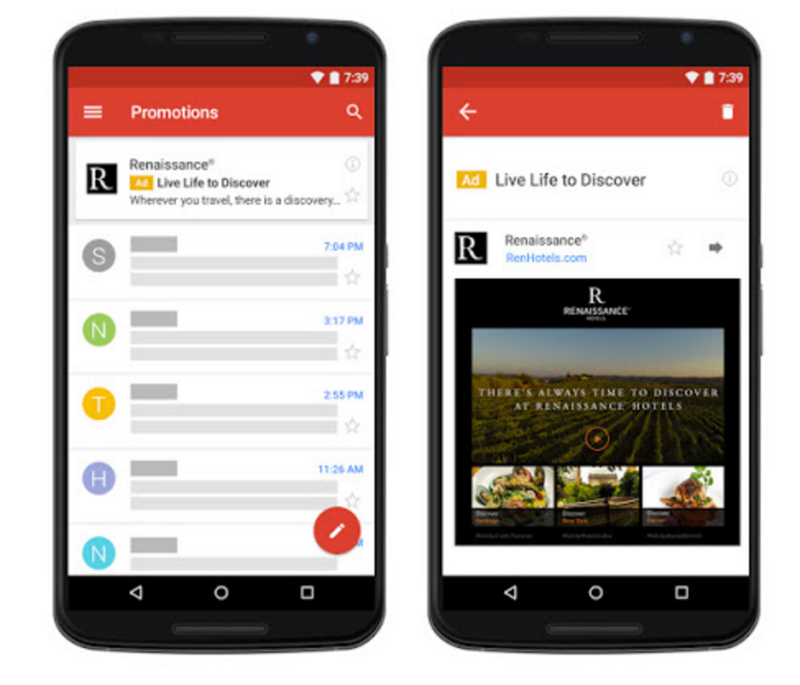 Below are some tried and true tactics to ensure your gmail ads are making the most impact. Customer Match: reach current customers and people who are similar to them. One important point to note is Google’s recent announcement that it will soon stop scanning emails to individual users for advertising purposes. However, as The Verge points out, “Google can still parse search histories, YouTube browsing, and other Chrome activity as long as you’re signed into your Gmail account.” So marketers won’t completely lose valuable customer data with this upcoming change. You have even less space in a collapsed Gmail Ad than you do on Twitter – about 40 characters. So make sure you get to the point immediately and put the most enticing information upfront. If you can get someone to click the ad, it opens up to a full page layout with tons more real estate, but that’s the catch – you have to be intriguing enough to get the click. Aside from leading with strong messaging (and we can’t stress enough – Test! Test! Test! ), experiment with other ways to visually draw people in with the text. That includes using different characters or even emojis, as long as it doesn’t feel off-brand. You likely have a list of keywords that you use for other marketing channels. Add to this list by taking a look at what your competitors are using, or words that are directly related to your competitors. Check out our post on using social research to find out more about specific companies for tips on how to dig up every bit of information possible. You are not cheating or cutting corners by using what’s already available to you. Gmail’s provided templates are already mobile-optimized and often perform better than custom HTML templates (the last part according to Google). Don’t go spending time or money on a developer before you test the templates. Gmail offers four templates outside of uploading your own custom HTML template. Once someone clicks on the collapsed ad and it expands to a full page, landing page best practices can be applied. Read through our 5 Easy Ways To Boost PPC Landing Pages post before creating your next ad to make sure you’re accounting for the most important elements. Just because one template was supposedly created for a specific purpose (the multi-product promotion ad is a natural choice for retailers), with enough creativity, you can come up with innovative ways to make the templates work for your goals. Finally, you’ll never know if something’s working, or how to change course to make a campaign work, unless you’re paying attention to performance. Use the following four tips to make sure you’re recording and understanding results correctly. Google doesn’t automatically capture all the information you’ll need. You need to “opt-in,” or rather, set up your reporting table to record the relevant results. Tip #1 - Calculate your external Gmail CTR by dividing “Gmail clicks to website” by “clicks.” That will help you determine if your full-page layout is working. A high volume of clicks to expand, but a low volume of clicks to website means your headline is compelling, but you have some work to do on your full-page ad. Tip #2 - Take a look at your display impression share. If your share is low but you’re driving strong performance, consider raising your bids to increase impressions. Tip #3 - The reach estimates widget lets you see an estimate of impressions available per week on the Google Display Network for your ad group, based on your targeting. If your possible impressions seem low, adjust your targeting. 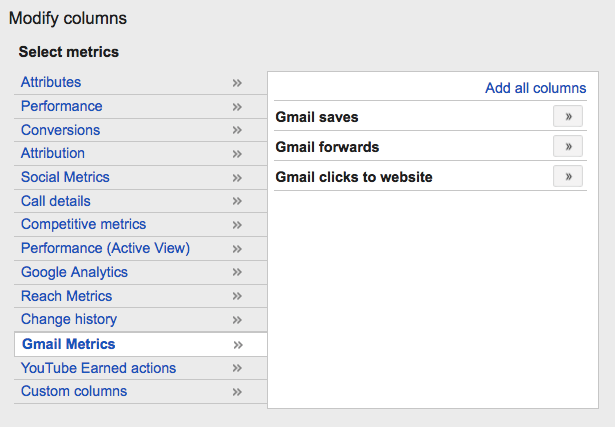 Take advantage of the 4+ hours per day potential customers are spending in their inboxes with these Gmail Ads tactics. That’s more attention than you’d get from nearly every other marketing channel, and if executed correctly, will give you an unbelievably low cpc.